The HTC One Max measures 164.5 x 82.5 x 10.3 mm, which makes it notably larger than the Samsung Galax Note 3 (151.2 x 79.2 x 8.3 mm). The extra millimeters around the waistline are particularly easy to feel on a device of this size and along with the much heavier weight (217g vs 168g) make the One Max notably harder to wield than the Galaxy phablet. Of course, the HTC One Max has dual front-mounted speakers and a 0.2" larger screen to show for it, and it's up to everyone to decide for themselves whether the trade-off is worth it. 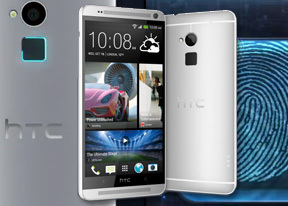 The HTC One Max is an instantly recognizable member of the company's high-end lineup. It offers the same combination of metal, high-quality plastic and glass as the One mini and provides the same premium feel as the other two members of the One family. The entirely plastic sides are certainly not as cool at the metal edges on the original One, but they are certainly more durable and since they don't take too much away in terms of looks, we find this a good solution. Of course a device this big can't quite match the sophistication of the mini (or even the original One), but once you hold the One Max you will immediately know that it's a premium offering. And while the weight might take its toll on the usability it certainly contributes to the solid vibe the phablet gives. And, yes, the fingerprint sensor doesn't sit as pretty on the silver back as it did on the home button of the iPhone 5s, but that's mostly nitpicking. Bottom line is the HTC One Max is a sleek smartphone, which you'd feel proud of owning (once you get past the usual "is that a phone or a tablet" jokes). The fingerprint scanner aside, the HTC One Max features the same set of controls as the other two members of the One family. The front panel still features a loudspeaker with BoomSound tech either side of the screen. A strip of glass right below the display is home to the two capacitive keys, Back and... well, Home. A long-press the Home button launches Google Now, while a double tap brings up the task switcher. There are no dedicated Menu and App switcher keys, but their absence is made up for with clever gestures around the UI. Normally you need to pull down when at the top of a list (app drawer or BlinkFeed for example) to reveal the extra available settings. Above the screen is the front-facing camera, plus the ambient light and proximity sensors. The top speaker takes the role of an earpiece during calls. The front-facing camera on the HTC One Max is the same as on the One - it has a 2.1MP sensor with a wide-angle lens and it can shoot even 1080p video, complete with HDR mode. The right side of the phablet features a couple of keys - the volume rocker and the power button. We have complained about HTC placing the power keys on its smartphone on top, where reaching it is the hardest and the company has finally listened. Not only is the right side of the One Max the most obvious choice for the location of a button as frequently used as this one, but the location also lets you index finger fall right above the fingerprint scanner when unlocking the device. The microUSB port and the mouthpiece are at the bottom. The USB port is MHL-enabled, so you can use it for HD TV-Out and for USB Host functionality. There's a noise cancelling mic at the back of the phablet. Besides its usual noise cancelling duties, the second mic keeps track of how loud the ambient noise is and the One Max will boost the sound from the mouthpiece to make sure the other side hears you loud and clear. The top of the HTC One Max features the 3.5mm audio jack and the IR emitter, which can be used for controlling various home equipment. The phablet comes with a remote app preinstalled and we found it to work quite well, while supporting a long list of devices.